If you are looking to make email marketing a priority in 2019 (and yes – you should be! ), one of the first steps is to determine which email marketing platform is the best for distributing your content. Your choice of email marketing service can have a significant impact on the success of your marketing campaign, so it’s important to do your research. 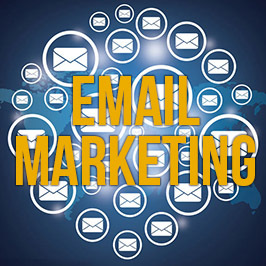 Email marketing is one of the most cost-effective marketing tools for businesses. Last year, email marketing saw, on average, a 3,800 percent return on investment (ROI): for every dollar invested, the average return is $38 (2018 Email Marketing Trends). This is because email marketing is relatively easy to manage, gives you full control, and allows you to make direct and immediate contact with your clients and prospects. It’s important to understand that a lot of your success with email marketing will depend entirely on the email marketing solution you choose because that choice is responsible for ensuring that your emails actually get delivered. It’s also essential to look carefully at the features offered in relation to cost — otherwise, you could end up paying a lot more money for fewer features and terrible deliverability, which will cause you to lose even more money (and impact). A good email marketing service allows you to create highly engaging emails, manage your contacts, separate (segment) users into groups and track the performance of your campaigns. Most importantly, a good email marketing service lessens the likelihood that your emails end up in your recipients’ spam folders. All of these features should drive traffic to your website and strengthen your firm’s brand. But where do you start? There are at least 30 email marketing services out there (both free and paid). Here are six popular options that may be a good fit for your firm. Some may be familiar (think Mailchimp and Constant Contact), while others may be new to you (SendInBlue and GetResponse). As with any technology platform you are considering, you need to allot ample time for a free trial period and use the system long enough to determine whether it is the best fit for you and your firm before formally adopting a platform. ActiveCampaign combines email marketing with Customer Relationship Management (CRM) features, so you can send personalized emails tailored to individual users’ behaviors. The program allows you to easily create eye-catching emails with its drag-and-drop builder and reach your subscribers directly on their mobile devices by sending Short Message Service (SMS) communications. The ability to track onsite events makes ActiveCampaign unique from other services. For example, you can track custom event calls from within mobile apps, billing apps and more. All your customer data will be organized into a sales CRM, giving you a complete picture of your clients and prospects. You can use this data to create highly effective marketing campaigns and follow-ups. Finally, ActiveCampaign makes WordPress integration easy, and also offers free expert migration service from other email marketing services to its platform. Pros: extremely powerful automation, thorough reporting, great deliverability and free migrations. Cons: limited 14-day free trial period; features can be a bit overwhelming; something to consider if you’re looking for a low-maintenance, beginner-friendly tool. Pricing: $15/month for 500 subscribers; $89/month for 5000. AWeber is one of oldest and most-popular email marketing service providers in the world, offering a wide-range of tools for small and medium-sized businesses to manage their email marketing. With AWeber, you’ll have access to ready-to-use email templates, list management, autoresponders and email tracking with detailed insights. Support options include live chat, phone, email, live webinars, and a vast library of how-tos and tutorials. Pros: can integrate AWeber with your WordPress website, landing page builder or opt-in form builder with ease; pricing structure includes all features regardless of subscription level. Cons: lacks split-testing functionality and some basic automation features found in other systems. Pricing: after a 30-day free trial, plans range from $19/month (up to 500 subscribers) to $149/month (10,000+). Constant Contact is one of the most popular and user-friendly systems available to email marketers. Features include customizable templates, contact management, integration with a variety of CRM and address book systems, social media sharing tools, and tracking and reporting functions. Constant Contact offers a 60-day free trial so you can really get a feel for the system before making a financial commitment. Constant Contact also has excellent customer support in the form of live chat, emails and discussion forums, and a vast library of resources to assist you with any questions or issues you may have. Pros: lots of customizable templates to choose from, great customer service; 60-day free trial period and integration with 431 systems, including Facebook, Eventbrite, Outlook, Gmail, and a variety of CRM systems (Zoho, SugarCRM, Clio and SalesForce, to name just a few). Cons: extra cost for features like email marketing automation, subject line A/B testing, surveys, polls and event marketing. Pricing: after the free trial, monthly subscriptions start at $20/month for up to 500 subscribers. Prices scale up from there based on subscriber numbers: 10,000 subscribers will run you $95 per month (with discounts if you pre-pay for six months or a year). GetResponse is more than an online marketing platform for email marketing. It also comes with additions like a landing page creator and a webinar solution, allowing you to grow your email list using beautiful email and high-converting signup forms. It has all the advanced features you’ve come to expect, such as list segmentation, A/B testing, autoresponders and software integrations. There’s even a cool feature called Perfect Timing, which helps predict the ideal time of day to send out emails to increase open rates. Pros: very simple to use plus bonus features such as response forms, landing pages, webinar creation and its very own CRM, all included in the monthly price. Cons: including a CRM system feature is cool, but cost for more than 10 users on one account very high. Pricing: after a 30-day free trial, GetResponse has four pricing levels, ranging from $15 to $165/month, based upon your list size and features wanted. One of the most popular email services on the market, Mailchimp is one of the only platforms to offer a “forever-free” email marketing service plan. Mailchimp comes with an easy email builder, autoresponders, segmenting contacts into groups and simple tracking for analytics. It also allows you to set up delivery times based on users’ time zones and segmentation based on geolocation. Pros: free (although somewhat limited in size and scope) subscription plan option; connects easily to your WordPress websites as well as 300 other apps and services. Cons: marketing automation features quite limited when compared to other providers. Pricing: MailChimp is free for up to 2,000 subscribers (requires branded MailChimp footer); from $10 to $199/month, depending on your list size and features desired. SendinBlue is a complete SMS and email marketing system for businesses. It is an extremely easy to use platform with great tools to create beautiful and highly engaging emails. The simple drag-and-drop tools are perfect for beginners with no experience in email marketing. SendinBlue includes automation tools that allow you to send transactional emails, create workflows and segment users. It can also select the best time to send email campaigns using its AI algorithms. Pros: low-cost plans, solid email automation, landing page editor and an SMS marketing tool. Cons: deliverability rates may not be as high as other platforms; editing features not as smooth and straightforward as they could be. Pricing: pricing is based on the number of emails sent vs. number of subscribers. Service is free for 300 emails per day (!) or fewer. As you begin to investigate different systems, you’ll notice that many of them offer similar services and features on the surface. To figure out which email marketing platform is best for you, make time to dig deeper into the programs, taking your budget and marketing needs into account. While your decision may not be an easy one, all of these platforms contain quality features and options that will undoubtedly help you up your email marketing game.